Fascism had always seemed to me a thing of the past. It was almost like a fairy-tale I was told — a passive deterrent, an unreal warning — while going through school. But school was not my education; my real education occurred as I entered the fight against fascism in the modern world, or, more accurately, as the fight was forced upon me. And so, the position I find myself in now is a position I stumbled into. I tripped into a chasm that had been obscured from me during my childhood and adolescence. I was not ready. I attend the University of Virginia in Charlottesville, a city that has drawn the attention of the entire world due to the scarred, beaten, and burned students who stood against white nationalists, white supremacists, and fascists bearing torches on the night of August 11th and due to the horrific murder that occurred on August 12th. It has been two months since those horrifying two days — two months of attempts at healing; two months of attempts at understanding; two months of attempts at fighting. The process of healing from, understanding, and fighting the germinating seed of the overt white supremacist movement in what I hoped would be my home drove me and a group of students at the University to address what surrounds the seed: the soil that allows for the violence of fascism and white supremacy to grow in and pervade our “modern” society. This hidden soil is the foundation that the United States of America is built on, a foundation laid by the founding fathers we, as a nation, so fervently revere. A group of students and I — hand-in-hand with faculty, clergy, and active community members — in mourning and commemoration of the victims of the battle waged in August, shrouded the statue of one of the most lauded founding fathers: one of the authors of the Declaration of Independence, the founder of the university I attend, the slave-master and colonizer, Thomas Jefferson. This action was, at its core, purely symbolic and in no way caused any physical damage. The university administration, however, saw the shrouding as a “desecration of sacred ground,” a profane assault on the image of the university’s benevolent father. Before I go into this, though, I must tell you of the wolf and the fox, an analogy that is useful in understanding the climate for oppressed peoples and invokes the thought of Malcolm X. Both hunters of lamb, the wolf and the fox use different methods to hunt their prey: one overt and openly violent, the other more covert and sinister. The wolf hunts the lamb combatively; snarling and ruthless, it chases the lamb in the open fields and devours it before the whole world. The fox, however, is more cunning in its hunt of the lamb. The fox shows its teeth as the wolf does but in such a way that it seems to be smiling; the fox seems a friend to the lamb, and it waits for the lamb to approach as a friend before it makes its kill. Malcolm X originally painted this picture to outline the relationship of oppressed people of color to the wolfish political “conservative” and the foxlike political “liberal.” I draw it in a similar sense: to invoke the different violent natures of outright white supremacy — marching through a university campus with torches chanting “white lives matter” and “Jews will not replace us” and driving a car into a crowd of anti-fascist protestors — and systemic oppression — present-day slavery in the form of the prison-industrial complex, gentrification, and capitalism itself, especially the hyper-capitalist neoliberal economy of the modern world. Symbols of the wolf such as the multitude of Confederate statues have rightfully come under attack, but the symbols of the fox pervade every part of Western society; the very institution of our republic is a monument to the fox. The brutality of the wolf makes the “gentle” nature of the fox seem an ideal alternative. However, the two are both inherently oppressive and cannot exist without one another. Our republic, designed by the founding fathers, is predicated on the limited understanding of freedom and liberty that is the basis of liberal philosophy. The notion of rights endowed at birth that cannot be taken away is a noble one, but as the implementation of liberal practice in politics and economics has demonstrated since its introduction into modern political organization, this notion is never without exceptions. At the beginning of our republic, the very idea of natural rights was a fantasy for people of color, those deemed under the law of our great republic to be inhuman property. The American republic is built on land taken through one of the most successful genocides in human history. Where was the right to life, liberty, and the pursuit of happiness for the natives, or the slaves, or the proletarians who had no property but their commodified ability as workers? These were not the persons Jefferson wrote for — indeed they were not considered full persons and thus not part of the republic. The systems of slavery and private property, then, are presupposed in the republic and those very systems are epitomized in our lofty and highly fetishized symbols of said republic. 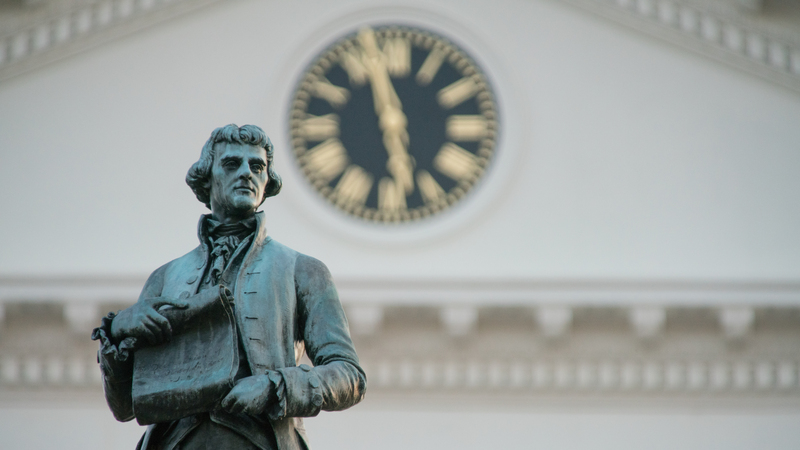 Thomas Jefferson, one of the faces carved into hills sacred to indigenous peoples, and the University of Virginia, a school that has consistently dehumanized workers of color and allowed — under the guise of upholding liberal values — white supremacy to fester within its walls, must be addressed as symbols that give white supremacy legitimacy as a movement. There is a reason that Richard Spencer and Jason Kessler, both well-known white supremacists, are obsessed with making the University of Virginia the new capital of white supremacy and fascism in the Western world. 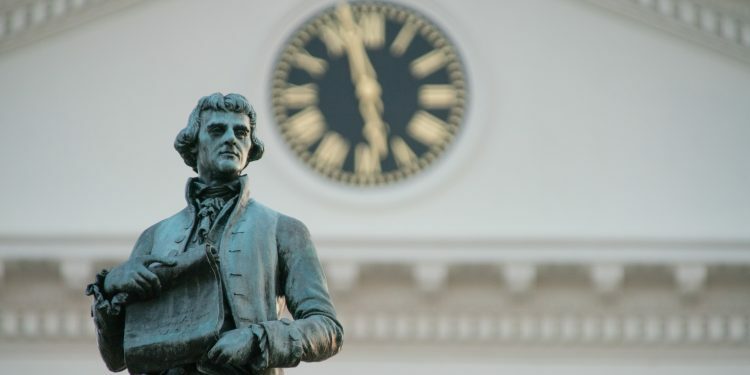 It is because the fetishization of Thomas Jefferson and the liberal republic has led to the fetishization of values and institutions that have served white supremacy for 200 years. To combat the wolf, we must combat the fox. Our world is structured by institutions of hierarchy and inequality, and it is through these very institutions that the fox can devour the lamb. Prisons everywhere are being filled with the poor, the impoverished, and people of color; in their sheer size our prisons rival the Soviet gulags, yet in our moral assessment of our prisons we rationalize their inherent oppression and brutality as a necessity, a “peace” predicated on unjust violence. Everywhere communities predominantly populated by people of color are being invaded by the privileged and the affluent, increasing rents and forcing those same people of color out of their homes and onto the streets — another form of structural, material violence. Healthcare is being taken away. Undocumented peoples are continually being stripped of their humanity. Labor is as alienating as it has always been. Life, liberty, and the pursuit of happiness remains a fantasy for people of color, for queer and trans people, and still for the whole of the proletariat. To combat the fox we must combat liberalism, capitalism, and our very republic that upholds these unjust conditions. This is why I helped with the shrouding: to attack the symbols of both the wolf and the fox. This is why I take part in every action I can at this University that makes the gruesome reality of people of color known to my peers and the world, as much as my peers and the world may twitch at the thought of their fetishized idol being desecrated. As a student of the university and a member of the Charlottesville community, it’s not only my responsibility but my imperative to communicate to my fellow community members what these symbols mean and what it means to subvert them. The Charlottesville community cannot afford to keep idolizing a man who perpetuated racism and dehumanization, nor can it afford to keep being subjected to a hierarchy that puts profit over its well-being and continues to be the bringer of destruction for the community. Capitalism and the way the university treats its community is the source of this destruction. The university administration and the Charlottesville city government have failed to serve and benefit the community, and frankly, they always will. A world predicated on capitalism and exploitation will never be free from oppression and the oppressed will never be free. We need a future devoid of idolatry, devoid of hierarchy, and devoid of the institutions that allow violence against oppressed people to exist. We need freedom now lest it become impossible in the future. This is a call for solidarity and action from those who have been too passive in the rise of fascism in the United States. We need a different collective understanding of the world we live in, and we must act on that understanding. The time for discussion and passivity is rapidly coming to an end, and those who live under the heavy boot of oppression can’t get out from under it by themselves. I keep asking myself questions in the wake of the infancy of my fight against fascism: how close are we to the fall of the republic? How close are we to the abolition of capitalism and injustice? How close are we to the revolution that I yearn for? These questions have always come after the one that has frightened me most: are we ready? I fear, considering the ubiquity of the republic and the symbols that foster white supremacy, we will stumble, trip into the chasm of fascism as the world once did. I fear that, as I have been unready for this existential threat to my existence and the existence of my closest friends and family, the world will not be ready for what is to come. Keval Bhatt currently attends the University of Virginia in Charlottesville, where he is pursuing a B.A. in Philosophy and a B.S. in Astrophysics.